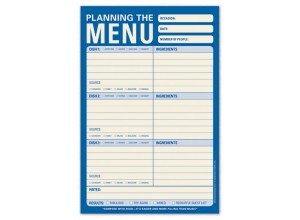 Menu planning is a great way for individuals to save both time and money on their weekly meals. Whether you’re looking to implement the system for a new diet, to be more cost conscious in groceries or simply to improve your weekly organization the process can be beneficial. We’ve gathered our 5 favorite tips for helping you to be successful in your new menu planning system. 1) Calendaring: To begin, get a paper or digital calendar that you will use to design your menus. Immediately mark off the days of the week where you routinely eat out. From there, decide how many meals per day and for how many people you will need to purchase for. Are you including lunches or just dinners? Are you cooking for just you and the family or are you hosting a large dinner? Factor all of these things into your schedule and determine how many meals you need. 2) Plan Smart: The goal of menu planning is to maximize the potential of the foods you buy and ultimately save you money. For some, the easiest way to do this is to start with the protein. If you plan to have chicken, steak, and shrimp for 3 meals, coordinate another 3 meals using the same meats. This means you’ll purchase less variety, but can make up for it in the types of dishes you create. The same concept is true for other specialty ingredients, sauces, veggies, etc. It is also important to take into account the freshness of the items vs. the planned meal date. For example, if you’re buying frozen veggies for one dish, but fresh ones for another, the latter dish needs to come first in the line up. 3) Shopping List: When organizing your shopping list, write out items in terms of their placement in the store. For example, group together all fruits and veggies in the same area of the list. This way you are less likely to miss something while you are shopping. In the store, you should also allow yourself to be flexible. If you have one veggie on your list, but another looks fresher or cheaper, feel free to swap them. 4) Meal Prep: As much as possible, attempt to do double duty in all of your meal prep. For instance, if you have chopped onions in tonight’s dinner as well as tomorrows, cut both at the same time. Store the second night’s onions in tupperware and you’ll have saved yourself some time tomorrow. This is also true for larger preparations. If you’ll be using a specific sauce again later in the month, you can easily make a larger batch and freeze the rest. 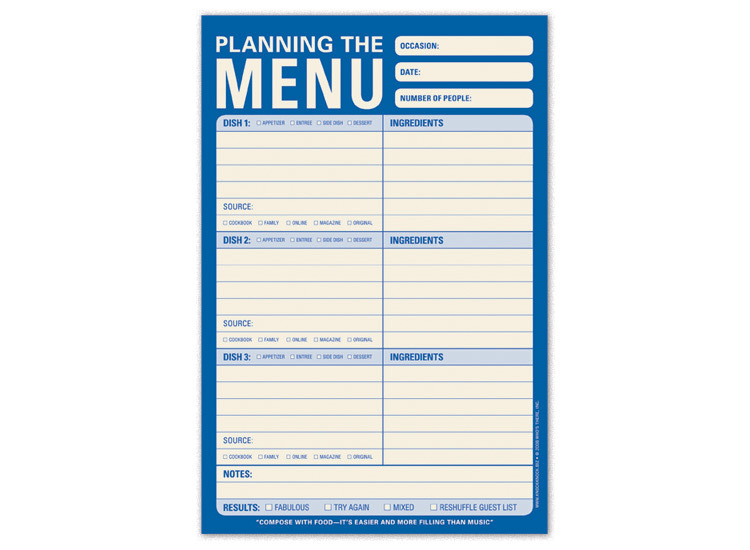 5) Execution: Keep the menu planning process on track by actually making the items on your schedule. If your cravings are guiding you in a different direction on a particular night, try to switch the meal for another dish that’s on this week’s schedule. By doing so, you’ll just be swapping days and not using ingredients planned for other dishes unnecessarily.